The Llano Estacado Underground Water Conservation District (LEUWCD) was created in 1991 by the 72nd Legislature. A confirmation election was held in November 1998 and the Initial Board was elected. A five member board of Directors, elected for staggered four-year terms oversees the LEUWCD’s work. The Board meets once each month on the second Thursday of the month. All board meetings are open to the public. The Board of Directors hire a District Manager, who is the Chief Operating Officer. The Board sets policies and adopts rules to operate the LEUWCD. 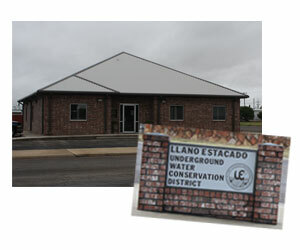 The Llano Estacado Underground Water Conservation District (the District) will develop, promote, and implement management strategies to provide for the conservation, preservation, protection, recharging and prevention of waste of the groundwater resources, over which it has jurisdictional authority, for the benefit of the people that the District serves.